Slim, fast, lots of settings, low cost. Just 2M file size, no registration, 1 minute to access. Support 500 users, 100 webcam, 1000 meeting room. 1 cost for enterprise usage, can invite guest to join meeting. No expensive, no hardware, no latest skill, no public server, private data, easy, instant usage. Install on private server or cloud server. 4 type of login, holder/guest, public, user, demo mode. One to One data transfer under public session. Perfect for remote office, no dial, connection all the day. Lots of settings, motion detect, made in HK. Flexible room, no room/user/time limit, create user in minute. 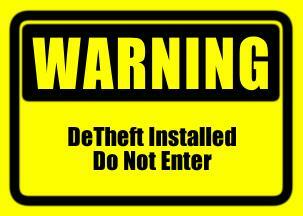 Run as antitheft, log motion detect and trigger command. Attach mobile mic to computer, run as hardware net meeting. Simple user interface with lots of features, 100% make in HK. MagConf is a simple and fast system, no elegance. To decrease memory usage, keep highest performance, we only handle minimum meeting data. Due to no choice and no comparison, you can't find difference. MagConf is now a new product, you can find difference. 1. Holder/Guest: Enterprise user need to discuss with external user, or group discussion in different area. Lesser feature then user mode. 2. User Mode: Highest login security, no guest or no holder diff. Allow offline send message and file, for enterprise internal usage. 3. 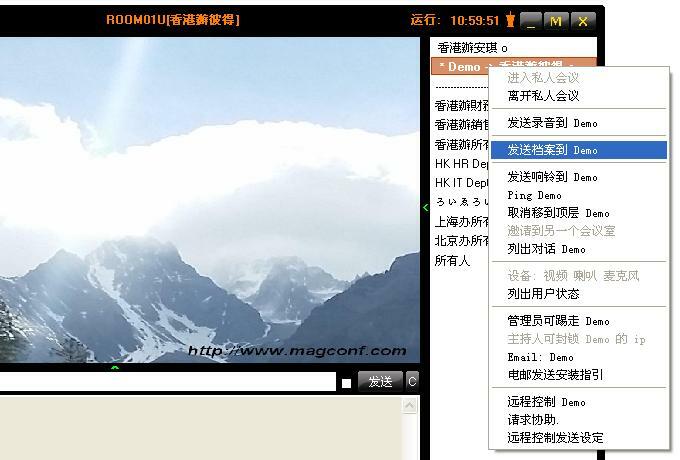 Demo Mode: Major for demonstration, share screen, talk to guest only, control guest to turn on cam/mic. 4. Open Mode: No security, anyone can login this meeting room, for test or open discussion. 1. Before you enter conference, study MagConf instruction. 2. Prepare your drink and accessories before meeting. 3. Prepare a headset and mic., perfect for voice streaming. 4. Ensure your background of webcam is simple, no colorful or debris. 5. 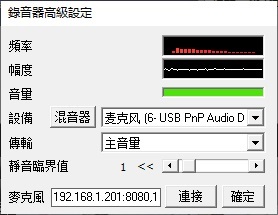 Try to turn off device with noise, ie. tv or radio. 6. 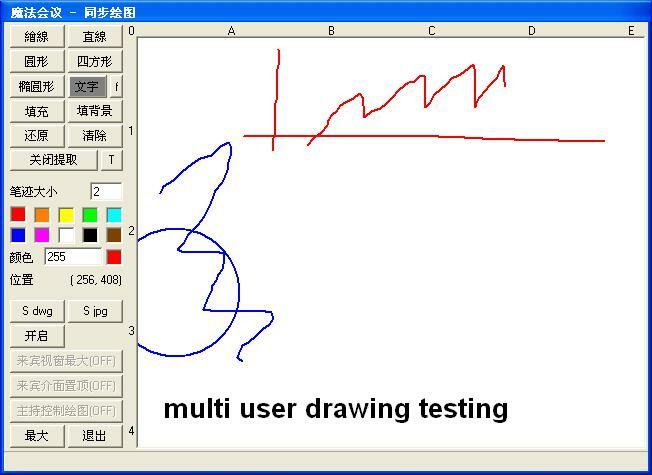 Try to make a login test on selected meeting room, self test your mic and headphone, adjust to a suitable value. 7. Adjust the webcam speed and resolution, avoid too much data going out. 8. Adjust your mic before meeting. Lots of webcam in a room, optimize ? Go to setting button, adjust Motion Detect Tolerance, smaller value have larger send out frame. Enable Motion Detection on My Cam and display red box, adjust the value and observe the accuracy. This will highly decrease the bandwidth usage. One to One Communication support single max 512G file size, public/guest/user mode support 100M file size, group user support 10M. If you are holder or the dynamic password of MagConf's room is valid for a long time, you can login to selected room, go to setting, create a shortcut on desktop. Then make use of this shortcut, set run command on outlook or other program scheduler. 1 fixed public ip, for MagConf software license validation. This hardware server must allow to visit our domain magconf.com to process validation. Server side support Windows server 2003 and later. If users less than 10 people, a Windows XP computer can be run as server. 1. Support Windows 2003 and later. If users less than 10 people, Windows XP/Win7/8/10 computer can be run as server. 2. 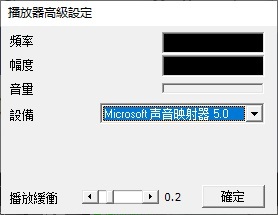 Save MagConf software copy and license key on server, then click mr.exe to start system. 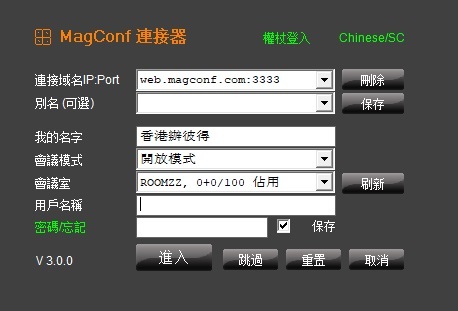 Input the license info and key on registration page, wait for magconf.com to verify your key and your public ip. 3. User can login now. 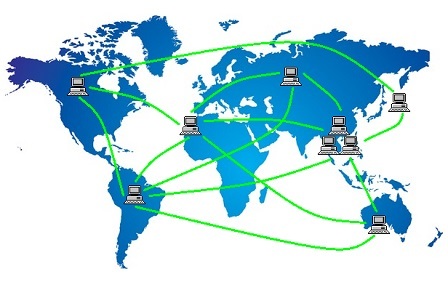 Ensure your server can reach and access internet. 1. Extract or run client soft copy, then run MagConf.exe to start, no validation is needed. 2. Run once as Administrator when start MagConf.exe at the first time. If fail to startup in future, also run once again as Administrator. 3. If PC installed with antivirus, allow MagConf to run. If still fail, stop antivirus then run again MagConf. First of all, save user list to Excel format, input user,description,password,email, then save your list to csv, and copy this list to setting.txt. It is suggested to use email address(without domain) as user name, set default password to 123456. Then send emails to user, ask then to login MagConf and change password. First of all, open/extract the server side download, do not overwrite files of current running system. Create another folder, copy all files of the extracted server download to this new folder. 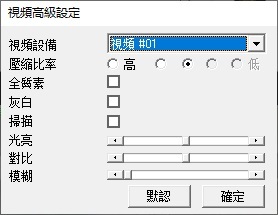 Start mr.exe on the new folder, select another config, set different listen port and then click start. 4 Steps and min 15 seconds to connect. No bandwidth limitation, no monthly charge. No expensive, no hardware consumption. No advertisement, no user registration, no trouble invitation. No large memory requirement, no latest computer. No big file download, no big database. No latest skill is needed, no trouble on installation. No huge bandwidth is required. No public server, store data privately. Settings: Flexible room count and user. Unlimited access time, user group, feature and hardware control, good for QoS. Voice : Easy to identify which one is talking in a group, no need to recognize by ear. Multi start up: Start up several MagConf on the same computer, share the same webcam. MagConf Sever can startup 9 times on the same windows server. 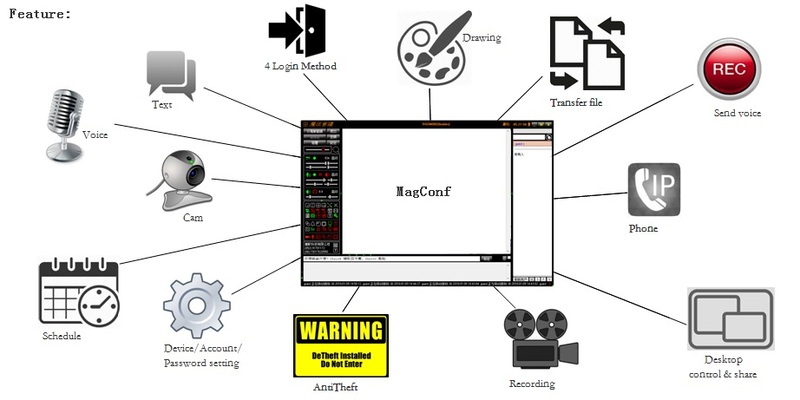 WebCam Control: Allow control other user webcam, suit for different network environment. Motion detect: Run as simple antitheft application, log motion detect and trigger command on remote computer. Mobile mic: Attach mobile mic to pc, run as hardware net meeting. Flexible user maintenance: very easy to create/update/delete user on server. Too simple user interface and no graphics, please beautify your design. We used email to exchange information in the past, it would be affected by internet traffic congestion. We now use IM in our business, it highly increased our working performance. Too complicated, should read menu before use. We have developer with over 20 years experience on IT jobs. After assumption, study, experiment, improve & create, then developed MagConf. ©2015 MagicSys Technology Limited, copyright reserved.